The more people bike on the streets, the safer the streets are for everyone who bikes. This phenomenon, originally identified by researcher Peter Jacobsen, is known as “safety in numbers.” And that’s exactly what American cities are seeing as they add bike infrastructure — more cyclists and safer cycling — according to a new report from the National Association of City Transportation Officials [PDF]. The report is part of NACTO’s research series on implementing equitable bike-share systems. NACTO makes the case that large-scale bike-share systems can improve access to jobs in low-income communities by extending the reach of bus and rail lines, and — citing the safety-in-numbers evidence — that good bike lanes have to be part of the solution. Otherwise dangerous street conditions will continue to discourage people from biking. NACTO tracked changes in bike commuting, bike lane miles, and cyclist fatalities and severe injuries in seven U.S. cities that have added protected bike lanes and bike-share systems over the past decade or so. In all seven cities, cycling has grown along with the bike network, while the risk of severe injury or death while cycling has declined. In five of the cities — Chicago, Minneapolis, New York, Philadelphia, and Portland — the absolute number of cycling deaths and severe injuries fell between 2007 and 2014, even as cycling rose substantially. In the two other cities — San Francisco and Washington, D.C. — deaths and serious injuries increased somewhat, but not as much as the increase in bicycle commuting. New York City, for example, has added about 54 miles of bike lanes per year since 2007. Chicago has added about 27 miles per year since 2011. Over that time the risk of severe injury or death while cycling has decreased by about half, NACTO reports. Surveys show that concerns about safety are a major deterrent to biking across race and gender lines, but creating safe street conditions for cycling is especially urgent for people of color, NACTO notes. The fatality rate for black cyclists is 30 percent higher than for white cyclists, and the fatality rate for Latino cyclists is 23 percent higher, according to a 2014 study by the League of American Bicyclists [PDF]. More cities can prevent cyclist fatalities and bring about the “virtuous cycle” of safety in numbers, NACTO says, by designing streets that appeal to the 60 percent of people who are “interested” in cycling but “concerned” about safety. The type of infrastructure that appeals most to people who hesitate to bike? Protected bike lanes. 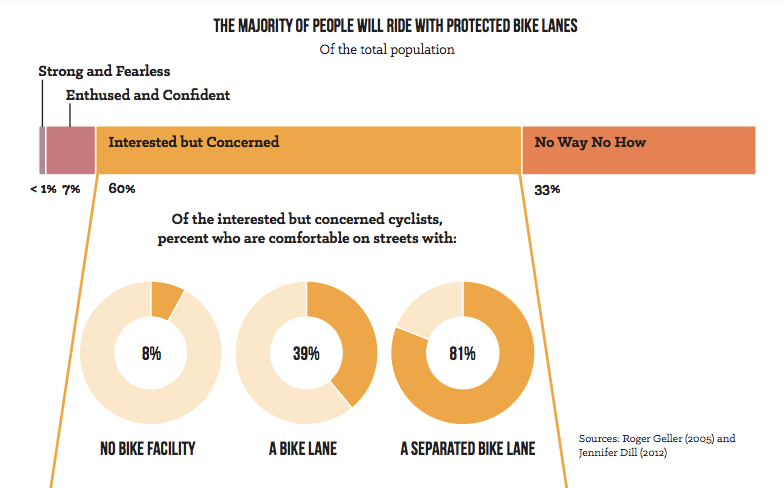 Among the “interested but concerned,” 81 percent say bike lanes that offer some physical protection from car traffic would make them feel comfortable biking, according to researcher Jennifer Dill [PDF]. We need to find a different motivation for cyclists that doesn’t increase risk by itself. Restricting speed (or cars altogether), modifying the more risky roads to discourage speed, ease “hard” maneuvers for bikes, and EDUCATE everyone to coexist safely. This is something that works, by the way: Madrid has seen a rise in bikes and a decrease in risk in the last few years with NO bike lanes whatsoever. We’ve had a new public bike system, which put a ton on bikes on the roads, and the addition of 30km/h lanes with sharrows to increase visibility. Those who have been cycling since before those changes took place know very well that, while cycling here wasn’t specially risky or dangerous, the respect cars have towards cyclists has increased noticeably. Which parts of the above visualization inform this weird and troll-ish comment? There is one weird data point, which is the year 2009 in Washington, DC. I don’t know if that alone proves anything, but I do wonder what was going on there that year. 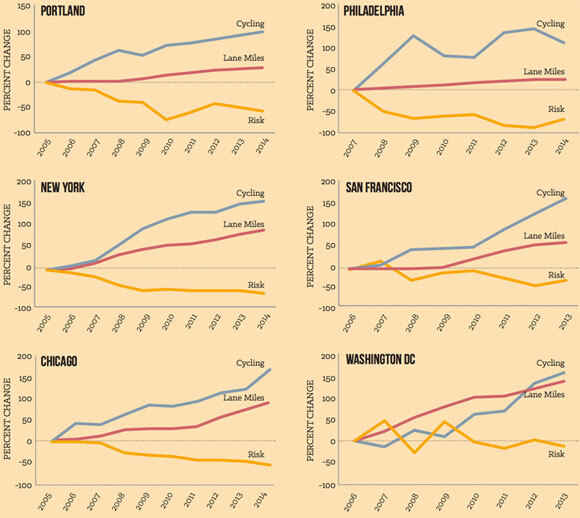 Compare Philadelphia and Portland (where cycling goes way up and risk goes way down while lane miles barely budge – Philly even has parallel rises and falls in the cycling and risk as if to make the point stronger) to Washington, San Francisco, and Chicago (where cycling goes way up and risk only goes down a bit, while lane miles go up a lot). Exactly my thinking. Safety in numbers may not be happening at all: it might be safety in infrastructure and driver education (which may have happened BECAUSE infrastructure was rolled out for cyclists). Portland already has a rather well developed bike infrastructure network. Philadelphia might be an anomaly, but in all others except Washington DC, the risk fell by more than 50%. Washington DC is unique because the political climate has been incredibly positive for installing speed camera, red light cameras, and they’ve also had a positive climate for stop sign cameras. What this does is it strongly decreases the tendency of drivers to make the kinds of mistakes that could kill cyclists and pedestrians. 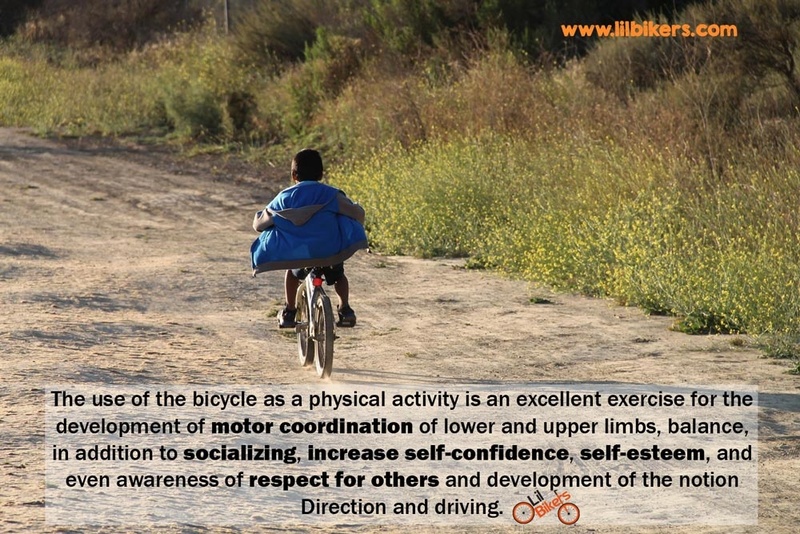 Walk and Cycling should be emphasized. Why? Marin County, CA went with bike lanes and separated paths using the $25 million federal monies they received from 2006-10 as one of four regions designated to increase cycling and walking as share of transportation. Even with other monies (from SMART train sales tax), regional air quality boards and city and county paved bike lanes, there were less than 20 miles of bike facilities built. Cycling increased more than walking has, but several cyclists have been hit in bike lanes (outside the driver’s cone of focus). More cyclists=more safety in general because of driver awareness, not usually from riders behaviors which tend towards anarcycling.